Enjoy your time with the After Orange non-alcoholic cocktail. A signature mocktail by Sanpellegrino, the multi-faceted After Orange is bound to become your go-to mocktail to relax to whilst enjoying your favorite afternoon treat. The familiar scent of vanilla and citrus are sure to conjure up memories of fragrant homemade sweet delicacies of southern Italy. Soothing and complex, the After Orange is a classic mocktail that expertly combines sweet, tart and sour flavors, underlined by the smooth aroma of vanilla. 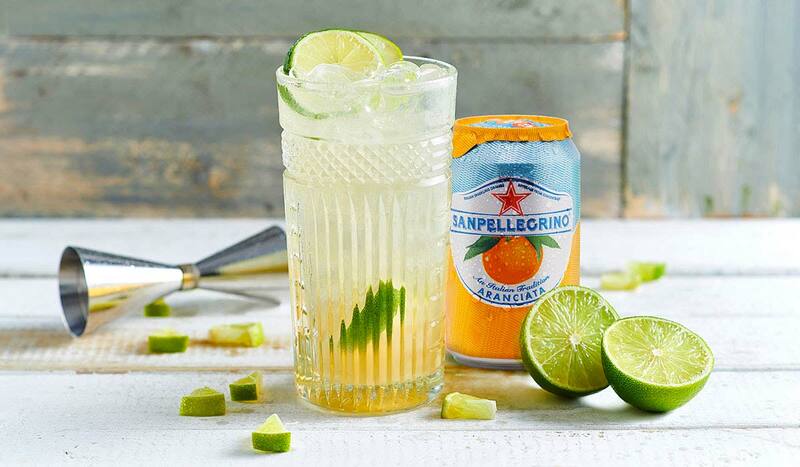 The lively Sanpellegrino Aranciata, with its delightful scent of freshly squeezed orange juice plays delicately with grapefruit, lime and vanilla to create a robust drink that goes nicely with dishes such as Sicilian-style eggplant rolls or some simple fried ricotta balls. Gently muddle the lime together with the sugar in the bottom of a large, 40 cl capacity glass. Add the grapefruit juice along with some crushed ice, then top up with Sanpellegrino Aranciata. Using a bar spoon, stir well until combined. Garnish with a dried lime wedge and grapefruit peel. If you are 18 years old or over you can turn the After Orange into sparkling fruit beverage by stirring a splash of tequila (1 oz/3 cl).